Are vegan beauty brands more ethical? Are vegan beauty products less toxic? Veganism is a way of life that can include diet, skin care products, and cosmetics. Choosing vegan skin care products can be beneficial for your skin, body, and the environment. Buyers beware — vegan labels can be misleading. There are many compelling reasons to go vegan, and not just in terms of what you eat. Vegan skin care products, by definition, contain no animal ingredients and have not been tested on animals. The benefits of using such products are many. Apart from containing gentler ingredients with proven health benefits, they provide a sustainable, cruelty-free alternative to the chemical-laden products that occupy many store shelves. Here’s why you should look into this growing trend, and what you can do to make your beauty regimen more eco-friendly. Lyndsey Brantley, a medical aesthetics practitioner and founder and CEO of Camelia Alise, a Houston-based manufacturer of skincare products, certainly seems to think so. “I formulated my own vegan skincare system out of a need for more natural cruelty-free products for my clients. We definitely prefer cruelty-free products over other items available on the market,” she says. This sentiment is echoed by many eco-friendly consumers and activists, with U.S. makeup companies often listed among the worst offenders. While the European Union introduced a ban on animal testing for cosmetics in 2009, animal welfare laws have had little impact on cosmetic manufacturing practices in the United States. Not only do most animals in laboratories remain legally unprotected, but there is also a shortage of inspectors to ensure that cosmetic manufacturers comply with existing regulations. The animal cruelty of synthetic skin care products also extends beyond the lab; chemicals and manufacturing byproducts end up in the oceans and other ecosystems, thereby threatening the lives of the creatures that live in them. For example, titanium dioxide, a chemical used in skin tints and sunscreens, has been demonstrated to stop phytoplankton from growing. This particular ocean flora is responsible for producing two-thirds of the Earth’s oxygen. Titanium dioxide can also cause damage to the DNA of freshwater snails. In addition, paraben, cinnamate, benzophenone, and camphor derivatives have been associated with the deaths of coral reefs worldwide. All four are common sunscreen ingredients. Brantley believes they are. As she points out, Camelia Alise’s skin care products are natural, handcrafted, and both paraben and sulfate-free. If you are weary of some of the chemical compounds found in many popular brands, this is definitely a strong selling point. Vegan skin care products are also less likely to cause the inflammatory or allergic reactions that are associated with their chemical counterparts. Many synthetic skincare products contain chemicals such as parabens and phthalates, which are poisonous to the endocrine system. In addition, the inhalation of synthetic aromas and fragrances can cause serious internal complications, including cancer, nervous system disorders, and birth defects. In fact, it has been established that pregnant women exposed to phthalates are more likely to give birth prematurely. The regulatory framework within the cosmetics industry has not kept up with the realities of the market and consumer aspirations. As a result, many products claiming to be vegan and natural may contain animal and chemical ingredients. That said, there’s a wide range of genuinely natural, cruelty-free products on pharmacy and store shelves. Here are a few recommendations. 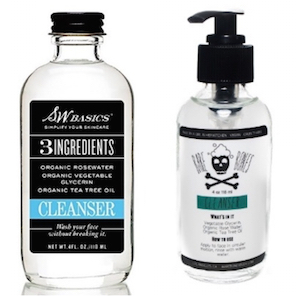 Two of the top-rated vegan organic cleansers of 2017 were the SW Basics Cleanser and the Bare Bones Body Facial Cleanser manufactured by Non-Toxic Revolution. Both contain only three ingredients: organic rose water, organic tea tree oil, and organic vegetable glycerin. They can be used on all skin types, but are especially recommended for people with sensitive skin. The tea tree oil provides antioxidant, antimicrobial and anti-inflammatory potency to heal wounds, while rose water has anti-inflammatory and anti-aging properties. Naturopathica Aloe Cleansing Gel is certified organic by ECOCERT, a leading global inspector of fair trade food, cosmetics and textiles. The gel contains high concentrations of organic aloe vera, plus organic lavender flower, and organic rose oil. Aloe vera’s anti-inflammatory properties makes this product a particularly suitable choice for those with sensitive skin. 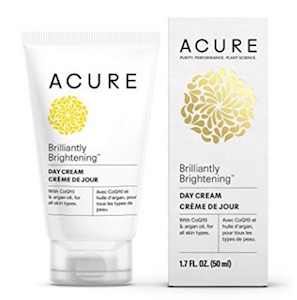 The Acure Organics Day Cream moisturizer, made of gotu kola stem cells, is recommended for psoriasis and eczema. Gotu kola, a Central Asian plant, has antimicrobial, antioxidant, and neuroprotective properties. In cosmetics it has demonstrated potent anti-inflammatory and moisturizing capabilities. It is also more effective at protecting against the harmful effects of sunlight than other natural ingredients used in skincare products. Vegan beauty products aren’t only easier on the planet and less likely to cause adverse reactions than their chemical counterparts — in many cases they’re actually more effective. » To find out more about the benefits of natural beauty products, ask a cosmetic doctor for advice and schedule an appointment using Zwivel’s free online consultation tool.